Here's some handy fishing tips to keep in mind as you plan your Fly Fishing trip in the Great Smoky Mountains. This list will help you discover some "tricks" as you deal with wild trout, born and raised here, and some of the other fish popular in the area! Before leaving for your trip, be sure you have a license! Don't fish in the same spot! Cast your line a few times, then move upstream. Trout are pretty smart. If they see you, they may stop biting. Look out for your own shadow! They don't actually have to see you, they can become nervous and move away if they pick up your shadow. Wearing dark clothing may be a good fishing tip to live by. Keep your fly moving at the same rate as the current. Other stuff like sticks, trash, etc....that manage to get into the water go with the currant. 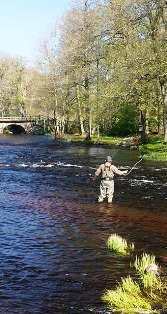 If you keep your fly moving at this rate, the trout will not become suspicious. As you fish, a good fly fishing tip to remember is making sure the water is the right temperature before casting your line. A good temperature for catching trout is 50 to 60 degrees. Make sure you find a place you can call your own. If you tread into waters where others have been, the trout will be much harder to catch. You might walk along the trail and fish in waters that look good to you. The trout you'll find most often in the Smokies is Brook Trout, Rainbow Trout, and Brown Trout. 1. Looking for Smallmouth Bass? Find streams that are deeper and have slow moving currents. These streams are generally rocky at the bottom, and have boulders. A good place to fish for Smallmouth Bass will generally be within a few miles of the West Prong. Eagle Creek, and Noland Creek near Fontana Lake are also good areas for finding Smallmouth Bass. 2. Abrams Creek is another good area to find the Smallmouth Bass. The reason most people don't fish here because it's harder to access. 3. Keep in mind the Smoky Mountain National Park Regulations that allow no more than five Smallmouth Bass to be caught at a time. These should measure at least 7 inches in length. Anything smaller should be returned to the streams immediately. Read more about this by going to "Fishing Trips." Abrams Creek is home to two endangered fish types, and two threatened fish types. These are Smoky Madtom, (endangered) Duskytailed Darter,(endangered) Yellowfin Madtom,(threatened) and Spotfin Chub. (threatened) These fish range in size any where from 3 to 5 inches long. Basic tips for catching these fish are generally the same ones used to catch other kinds of fish. Have the right equipment, wear clothing for fly-fishing and obey all rules and regulations. The tips I've listed here are for fish that are most popular to the area. There are over 50 species of fish in the Great Smoky Mountain streams! I hope this page has been beneficial in helping you catch lots of fish while vacationing in our area.